Last season Mason Raymond struggled. There is no way around the fact. He was coming off of a serious back injury suffered in the Stanley Cup Finals and never seemed right. In fact he at times seemed like he could barely stay on his feet. Raymond falling down became a punch line for Canucks followers and the once promising looking forward slumped to only ten goals and twenty points. A far cry from the player he appeared to be growing into a couple of years prior. He never seemed to find a home up and down the lineups and even found himself a healthy scratch for a couple of games. This year Raymond seems to be a different player. For starters, he’s staying on his feet. He’s also provided the Canucks with some much needed spark and a little bit of secondary scoring – something they are desperate for. When Ryan Kesler went down last week with a broken foot Alain Vigneault moved the much maligned Cochrane, AB product to the second line center position. Since that promotion, to a position he had not played in a long time, Raymond has responded with three points and is plus 5 in three games showing great speed and an accurate wrist shot. 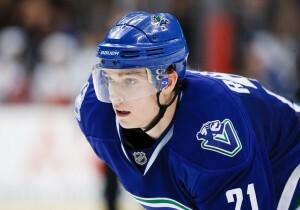 Not only that, he has found some chemistry with Jannik Hansen and Chris Higgins on his wing. Hansen has scored goals in the last three games and in many ways that line has been one of the most consistent lines the Canucks have. The combination of Raymond and Hansen give the Canucks a line that can blaze with the fastest skaters in the league. For starters, Kesler is going to be out for a few more weeks and with their lead in the Northwest a little smaller than they are used to, the Canucks need to do more than tread water. They need to start winning consistently. Vancouver has been up and down this season, and lately they’ve been down more than up going 3-4-2 in their last 10 games. Is Mayson Raymond the savior? No. But if he can continue to provide a spark with his tremendous speed, and if he can continue click with this wingers the Canucks may be able to weather the storm just fine. When Raymond first hit the Vancouver scene in 2007-2008 it seemed like the skies were the limits for him. He scored 25 goals two years later and Vancouver felt like they had a young exciting player in their fold. He has not lived up to those expectations since but now has a chance to do so, and change everyone’s perception of him at the same time. An improved Raymond will give Vigneault more options with his line up when Kesler does return. With the way Raymond and Hansen have been playing moving the two of them to the third line should give the Canucks three solid lines that they can roll. Up until now it would be hard to find a time this season they could roll more than a line and a half. Vancouver has run through the Northwest division in the last several years and so far this year have gone 6-1-1 against their division opponents. While that’s good, and should ensure them at least the third seed in the West, their record against the rest of the conference is not so hot. The Canucks have gone a pedestrian like 5-5-4 against the non-Northwest foes this year, you know the one’s they will see in the playoffs. If they are going to make a play off run they will need to not only get healthy but get consistent production up and down their lineup. Mayson Raymond appears ready to go.